You are spoiled for choice with places to visit and things to do in London. Here are just a few ideas of things you might like to include in a tailor-made tour. Where entrance fees apply I will provide you with full details of the discounted rates available before you book. If you have any other ideas that are not mentioned below, just let me know and I’m sure I can arrange it! Turn a corner in the centre of 21st century London and find yourself face to face with a medieval castle, complete with battlements, walled towers and a moat! 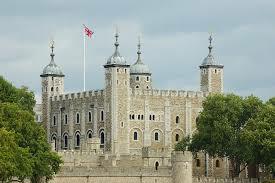 Built as a fortress and stronghold, the Tower of London has also served as a royal palace and a dreaded prison and is where 3 English queens were beheaded! Learn about its grisly and romantic history then marvel at the Crown Jewels, including the crown the Queen was crowned with, the crown she wears to open Parliament every year and the Sceptre with Cross which the sovereign is given when they are crowned and which includes the largest cut diamond in the world! St Paul’s is London’s cathedral and London’s symbol of survival. It rose from the ashes of the Great Fire of London of 1666, the masterpiece of the architect Sir Christopher Wren, and famously survived the bombing of World War 2 giving hope to millions of Londoners. Westminster Abbey is the royal church where English Kings and Queens are crowned. It has been the venue for every coronation since William the Conqueror in 1066, including that of our current Queen. It is also where Prince William married Catherine Middleton in 2011 and it is a royal mausoleum with 17 royal burials, including the famous Queen Elizabeth I.
London has always been a trading port and the Thames is the reason London exists. Take a boat trip along the Thames to see London from the water, with views of Big Ben, the London Eye, Tate Modern, Shakespeare’s Globe, Tower Bridge, Docklands, the modern skyscrapers of Canary Wharf and the O2. Then take a flight across the Thames on the Cable Car and walk along the river path to see the Thames Barrier which protects London from flooding. Maritime Greenwich in south east London is a UNESCO world heritage site, architectural gem and window into British history. Explore London’s maritime links at the Old Royal Naval College, originally built as a hospital for disabled sailors, the National Maritime Museum and the Cutty Sark, a beautifully restored tea clipper (sailing ship). Admire the architectural simplicity and beauty of The Queen’s House, built as a “house of delights” for British queens and enjoy its wonderful collection of royal and maritime paintings, including the iconic Armada Portrait of Elizabeth I.
Lastly, visit the Royal Observatory and find out how we finally solved the Longitude problem and stand with one foot in the eastern hemisphere and one foot in the western hemisphere! Explore over 500 years of history at Hampton Court Palace, the palace that is really 2 palaces in one. First built by Cardinal Wolsey in 1514, it is home to Henry VIII’s apartments, where so much of his history with his many wives actually took place. Also not to be missed are the Tudor kitchens, the largest of their kind, a real food factory! Having explored the Tudor palace you can visit the remodelled baroque palace built c1700. In the King’s Apartments you can go back to the reign of William III at the end of the 17th century, and the Queen’s Apartments take you back to the 1720s and the glittering court of George II and Queen Caroline. Hampton Court also houses some of the best and most famous art from the Royal Collection, including the “Windsor Beauties” and Mantegna’s “Triumphs of Caesar”. Lastly we will explore the MAGNIFICENT gardens. There are 60 acres of formal gardens, privy gardens, sunken gardens, the oldest vine in the world, the longest herbaceous border in the world, an exquisite rose garden and the famous maze! The gardens are set nestled on the banks of the Thames and bordering the 250 acres of Home Park, Henry VIII’s original deer park. Kensington Palace is a working royal residence, home today to the younger royals, the Duke and Duchess of Cambridge and Prince Harry, and to the Queen’s cousins. It was previously home to Diana, Princess of Wales and the birthplace and childhood home of Queen Victoria. Although the private royal apartments cannot be visited, the great state apartments are open to the public. The state apartments tell the Palace’s story, from its purchase by William and Mary in 1689 (told in the Queen’s Gallery) and its heyday in the 1720s and 30s at the centre of the sophisticated Georgian court of George II and Queen Caroline (told in the King’s Apartments). Later the young Queen Victoria was brought up at the Palace by her controlling mother, the Duchess of Kent, and it was here, aged just 18, that she learned she was Queen. Her story, from childhood through accession and marriage to Prince Albert, is beautifully brought to life in a permanent exhibition. The Palace also houses pieces from the Royal Dress Collection, presently a unique exhibition of Princess Diana’s dresses charting her story from “shy Di” to confident and capable woman and humanitarian worker. The Palace is set in beautiful gardens which merge into the royal park of Kensington Gardens, and no visit would be complete without a stroll through the grounds laid out by Queen Caroline and inspiration to so many ever since, including JM Barrie, author of Peter Pan. Please note: in accordance with Palace rules, I can only guide small family groups (approx 8) in detail around the Palace. Descend beneath the streets of central Westminster to the bunker where Winston Churchill directed the war effort during World War 2. Completed just one week before the outbreak of war, the bunker became the essential hub of the British war effort where the men and women who directed the war worked and slept, the War Cabinet met, all intelligence was collated and analysed and where Churchill made some of his wartime radio broadcasts to unite the nation and bolster its morale. Four rooms remain as they were when they abandoned shortly after the end of the war, including Churchill’s bedroom (pictured) and the fantastic Map Room, forerunner of today’s situation room and the engine of the war effort. Other rooms have been lovingly recreated from photos and the testimony of those who worked there. In the centre of the bunker is the wonderful Churchill museum, charting the life of the extraordinary man who became Britain’s wartime Prime Minister. Starting with the war years, the museum also explores his childhood, his role during World War One, his politics in the 1930s, his family life and his role as Cold War statesman and contains some truly fascinating exhibits including one of Churchill’s all-in-one “romper suits”, a German enigma machine and an interactive timeline of his 90 year life!